Who is it for? The Aroma Magic Oily Skin Blended Oil is for all the women who have oily and acne prone skin. Take a few drops of the blended skin oil and gently apply all over your face. Pat the product on your face so that your skin quickly absorbs all the oil. The outer packaging of the product reminds of something very natural and earthy every time I look at it. The inner bottle is a glass one and is tinted blue, so as to protect it from light. The cool blue colour automatically makes you feel cool. The oil has a very runny consistency. It almost seems like water. It is absolutely transparent with no hint of colour. The blended skin oil has a very fresh fragrance which feels like peppermint. I absolutely love this oil smells and feels on my skin. I use this oil every day after cleansing and toning my face at night. I have been using this for 3 months now, and this is one of the products that has worked wonders for my skin. As soon as you apply the product, you feel a cooling sensation on your face. It gets absorbed into the skin quickly and controls oil secretion for 5-6 easily. I even use this oil before applying makeup. The fragrance is to die for!!! Absolutely nothing! I love it!! Yes, definitely. I will be repurchasing this product and I will also recommend anyone with oily skin to check this out. This has worked wonders for my skin! Aroma Magic O3 Lavender Oil – Yay or Nay ? 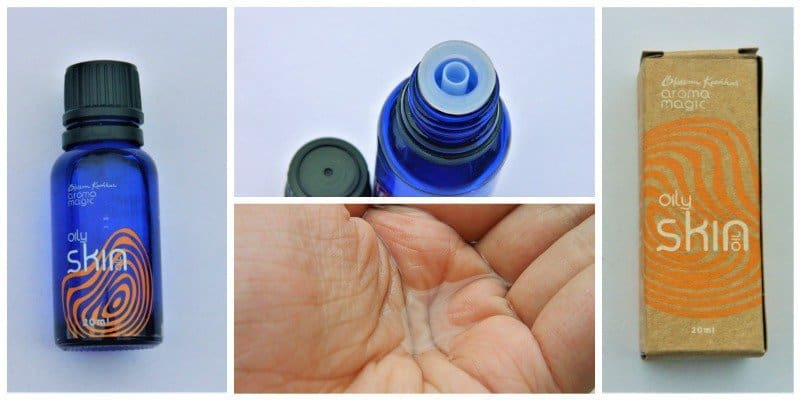 Aroma Magic Sensitive Skin Oil – Is Awesome ?! Wowie!!! Again a great natural oil by aroma magic that too with the capability to reduce acne ….nice !!!! I was skeptical about trying oils on my face as I thought it might cause pimples.. This one does not seem like that..